BeFit Body & Mind is here to serve you! We offer Health Coaching, Aromatherapy, and teach yoga, meditation, breathing exercises, traditional exercise, and nutrition counseling. At BeFit Body & Mind our mission statement is to “Educate the world about the power of food & herbs”. We promote an educational aspect and give clients access to where these ideas come from including; lifestyle choices, breathing and breath awareness, meditation, movement both yoga and traditional exercise, and food, herbs and plants to not only help you live to your fullest potential feeling vibrancy ~ also to protect our Nature; plants, insects, and animals that we cohabitate with. We started in the early 90s teaching nutrition, personal training, and individualized exercise programs. By the mid-90s we branched off into yoga and went deep into the ashtanga and vini yoga methods. 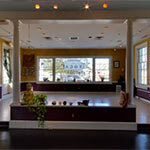 We opened our first yoga studio in 2001. In 2005 we added in the study of herbs and oils (both western and ayurvedic) for a more holistic approach to self care/health care. In 2017 we added Health Coaching to our main services realizing our nation is suffering from bad food and bad medicine. It is our goal to educate you about food, holistic approaches, and movement and breathing exercises to allow you to live to your fullest potential feeling vibrant and full of life. Health coaching and Aromatherapy is available by phone, video conferencing, or in person. Bobbi Misiti is certified by the Functional Medicine Coaching Academy, an affiliation with the Institute of Functional Medicine. We offer individualized yoga practices including therapeutic yoga when needed. Yoga includes deep breathing, movement with breath awareness, and where necessary postures to heal a sore or injured area with movements to enhance blood flow for healing. We offer group classes in Camp Hill, PA, workshops worldwide, and online individualized yoga anywhere in the world. We promote the educational aspect of the practice and give students access to where these ideas come from. Each class or session begins with a “topic of the month” dealing with food, nutrition, yoga philosophy, therapy technique, meditation or other health benefit that is shared before classes. Check out a 360° virtual tour of our studio.